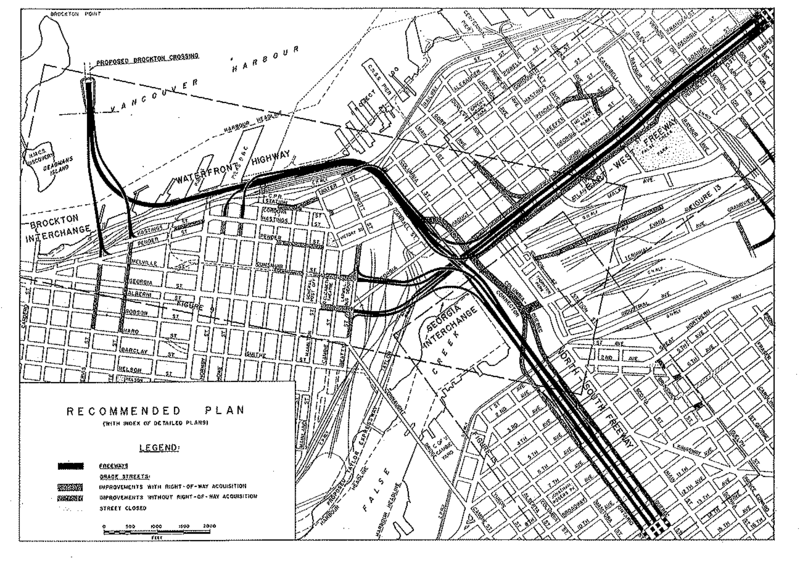 What roads were planned for Vancouver but never built? Was the 99 ever planned to reach the TCH as a freeway? What about 91A? Any thought ever given to an eastern beltway or a northern bypass of 7? Hm. BC is one of the historic maps missing from my collection, so how would I trace back the history of the TCH through Vancouver? Wow, I didn't know that the Cassiar Tunnel wasn't built until 1991. Also, that's interesting that they wanted to make a tunnel under the Burrard Inlet. 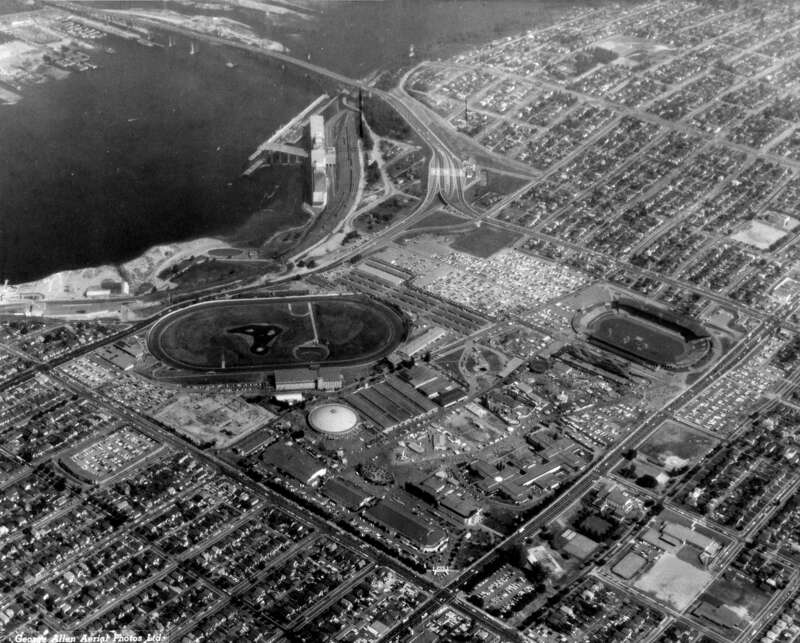 I generally use old aerial photographs, if available. I'm not so good at collecting maps. I would like to point out something now, before I forget to later. Those who live in the highly-urbanised parts of Vancouver are more of your anti-freeway types. Those who live in Greater Vancouver (i.e. the suburbs) are more apt to support freeways, road widening, etc. Several freeway-grade roadways exist in this "Greater Vancouver" area: Hwy 91 (the Richmond Freeway), Knight Street south of Marine Drive, the South Fraser Perimeter Road ("SFPR"), Golden Ears Way, and so on. The Knight Street freeway was opened in the mid-70s, Hwy 91 in the mid-80s, and the SFPR and Golden Ears Way in the late 2000s. My point? Freeways do exist in Vancouver; the grade-separation of roads, widening of bridges, and rebuilding of interchanges is something that has been happening for decades, and continues to happen today. The urban Vancouver freeways were canned in favour of SkyTrain in the 70s, but the suburbs got their freeways. Until 2011, there was no freeway-to-freeway connection between Seattle and Vancouver. The SFPR sort of ended this era. The road is not totally a freeway, but it has an 80 km/h limit, with several full interchanges, and acts as a sort of Vancouver bypass. The problem is that you encounter some serious backtracking going from Hwy 91, up the SFPR, all the way to the Hwy 1/Port Mann Bridge (10 lane toll bridge, opened 2012). So much backtracking, in fact, that it's usually quicker to stay on Hwy 99 through the city centre. Much to my chagrin, it appears that the Cassiar Tunnel/Connector was actually the final segment of the Hwy 1 freeway project that the transport ministry had been undertaking for several decades. According to this PDF from the Ministry (which Alps might find interesting), much of the freeway was actually complete by the 70s, then promptly labelled as Hwy 401. There were some signals remaining in key areas (such as those at the Hastings St junction), but the road was mostly all freeway by the early 90s. If they ever plan to close the Lions Gate to cars (which they are supposed to by 2030), they need to get to work on another Burrard Inlet crossing. The Ironworkers (Hwy 1) isn't cutting it, especially when you consider the miserable interchange with the Dollarton Hwy. Somewhat interesting. Page 18, it looks like there's a spur to the southwest through the middle of Rupert Park, instead of just the current one-lane exit. Was that 1 going over to Rupert St? I imagine it then turned east on Kingsway. Page 18, it looks like there's a spur to the southwest through the middle of Rupert Park, instead of just the current one-lane exit. Was that 1 going over to Rupert St? I imagine it then turned east on Kingsway. Very interesting observation. While I still cannot can't find any old maps, I did find this snippet from the City of Vancouver's website: "[Rupert Park's] main distraction was a major highway bisecting its rolling greenswards...In 1995 the park was completely refurbished and the road removed making the property whole once again." As far as I can tell, this was simply an extension of Rupert Street towards Hwy 1, where it more than likely formed a signalized Y-junction with the highway. The extension of Rupert St through Rupert Park was shut off with the opening of the Cassiar Tunnel. 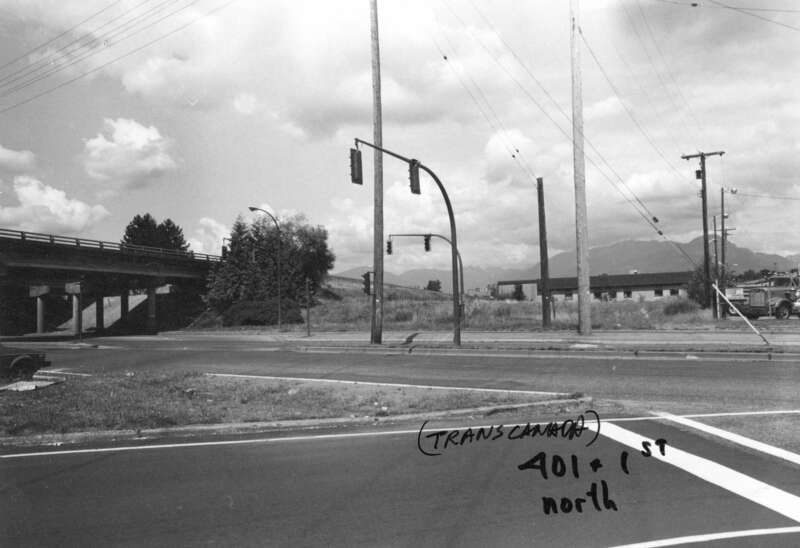 Once the highway was fully grade-separated south of the Burrard Inlet, and the ramps to/from East Hastings opened, the road was closed, and a new off-ramp constructed. The old pavement appears to have been left in-place for a couple years before removal in 1995 (the new Rupert St off-ramp was constructed before then). Part of the work in the area resulted in the creation of a new road, called the "Cassiar Rupert Diversion"; I presume this name to be attributed to the closure of Rupert Street north of East 1st. Great links. That archive search allowed me to dig up a couple new maps (linked below -- can't post maps here due to size). 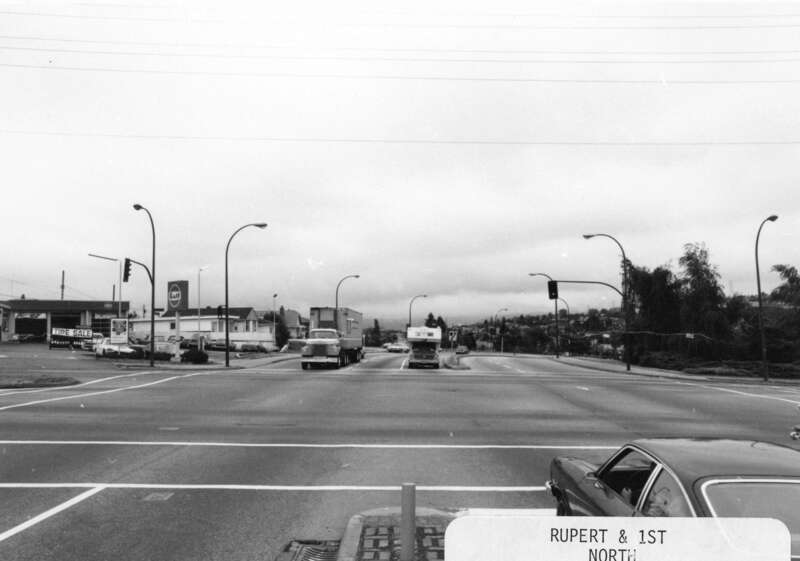 Here's one from 1990 that shows that diagonal stretch of pavement through Rupert Park. It was called the "Cassiar Rupert Diversion" (though as I mentioned already, this road still exists as a short, one block stub). This map, from 1974, shows the same road. You can clearly see that the ROW for the TCH, then called Hwy 401, narrowing as it reached Cassiar Street. The second is of Hwy 401 (the former name of Highway 1's freeway alignment, most of which was built in the 60s and 70s) at East 1st (or 1st Ave), looking NW (Street View image of current location). 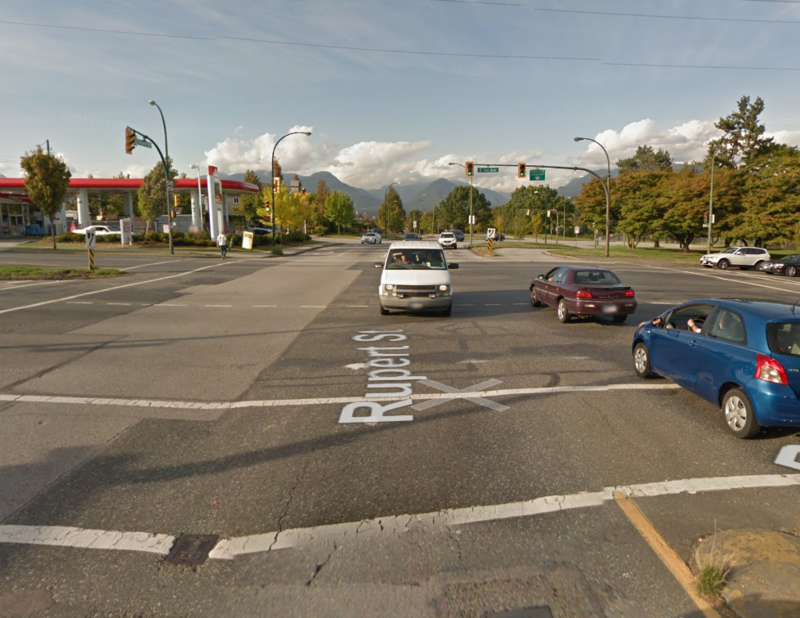 Note the lack of an on-ramp to the north; the 401 ended here, as it narrowed onto Cassiar Street. Here's another street view comparison. This is Rupert Street, looking north of East 1st (where it currently ends). There's a curve in both images, but the second one is just the off-ramp. The through lane in the second photo is bus only, and it swings left across the off-ramp, back towards Rupert Street.